October 9, 2013: Last night, 8 October, at least 9 people were killed in a factory fire at Aswad Composite Mills of the Palmal Group in the Gazipur district near Dhaka. 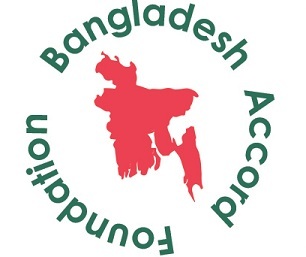 IndustriALL Global Union and UNI Global Union confirm their commitment to the comprehensive 5-year plan of the Accord for Fire and Building Safety in Bangladesh. October 10, 2013: Once again on 7 October, the World Day for Decent Work, worldwide attention has been drawn to the negative impacts of precarious work as unions around the world mobilize. 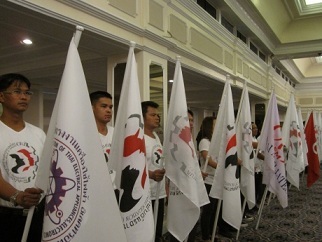 October 9, 2013: 6 October, 200 union delegates of IndustriALL Thai affiliates joined the official launch of Confederation of Industrial Labour of Thailand (CILT) held in the Bangkok Palace Hotel. October 10, 2013: More than half of the coal used in the Netherlands is imported from Colombia. Concerns have emerged about the situation in the Colombian coal industry, where activists and peasants are threatened and murdered, working conditions are precarious and trade union rights are violated. 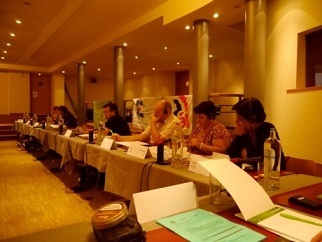 October 9, 2013: Holcim trade union network meets in Belgium and discusses joint strategies to answer Holcim’s attempt to generate 1.5 billion CHF (1.2 billion Euros) extra-profits on the back of their workers. The IndustriALL Bangladesh Council of trade union affiliates is working to assist the humanitarian relief effort following the fire that also injured a reported 50. The joint IBC team is working with both the families of the victims and the injured workers. This effort will coordinate with the labour ministry and the employer associations BGMEA and BKMEA. 135 workers of the factory complex’s 2,000 strong workforce were inside the two-story building when the blaze took hold around 5.30pm. Investigations are ongoing and we must wait to learn the causes of the fire. The Gazipur factory fire is shocking, but not surprising. The Bangladesh government has estimated that at least 50% of the country’s garment factories are dangerous. As the latest tragedy unfolds, work around the Rana Plaza compensation negotiations continues. Talks chaired by the ILO took place yesterday, with brands, IndustriALL, CCC, Bangladesh government, BGMEA, and Bangladeshi unions in attendance physically or via video link. Primark has taken the lead in the response so far ensuring that 3,630 families and injured will have received full 6-month salaries until the end of October. Tom Grinter, IndustriALL, Mobile: +41 79 693 44 99, tgrinter@industriALL-Union.org? To see more photo’s of the unions who participated in IndustriALL’s World Day for Decent Work click here. You will be redirected to IndustriALL’s website. To view more photos from the unions around the world who participated against precarious work click here and you will be redirected to IndustriALL’s website. Unions around the world have joined IndustriALL’s global campaign to STOP Precarious Work. As reports, photos and videos of actions come pouring in, IndustriALL has set up a campaign page dedicated to reporting on actions taken all around the world. From Chile to Croatia and from Finland to Madagascar workers voices are being heard loud and clear. Workers have taken to the streets in Peru, Colombia, Thailand, Brazil, India, Philippines, Sri Lanka, Nigeria and many other countries. 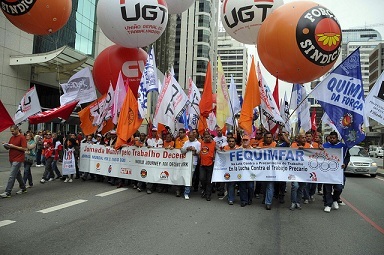 In Peru dozens of textile and garment workers, members of IndustriALL Global Union affiliate, the National Federation of Textile Workers (FNTTP), marched through Lima city centre on 4 October. In Thailand more than 3000 workers from the Confederation of Industrial Labour of Thailand (CILT), the State Enterprise Unions Confederation (SERC), Thai Labour Solidarity Committee and the migrant workers network and the informal sector network, marched to the Government House demanding the ratification of ILO Conventions 87 and 98 and labour law reform that adheres to international labour standards. In Madagascar at Rio Tinto operations at Fort-Dauphin, workers and members of the Fédération des Syndicats des Travailleurs de l’Energie et des Mines (FISEMA), in the midst of their struggle on the settlement of the mass dismissals in the plant distributed flyers on 7 October to mark the World Day for Decent Work . Elsewhere, unions raised awareness of the issues with their members, debated union responses to precarious work and sent letters to their governments demanding action. In Cambodia, IndustriALL Global Union affiliates of the South East Asia Region met to develop their strategies for 2014 to fight Precarious Work. If your union has taken action around 7 October, but your actions don’t appear on IndustriALL’s STOP Precarious Work campaign page, then send them to: press@industriALL-union.org. You can also tweet using the hashtag #STOPprecariousWork or share your actions with us on facebook. The new Confederation has 148,540 members from 211 local unions active in the sectors of electronics, electrical appliances, auto and metal, textile and garment, paper, petroleum, materials, chemical, oil, gas and electricity. Four national federations are founding members of CILT namely Thai Confederation of Electronic, Electrical Appliances, Auto and Metal Workers (TEAM), ICEM Thai Council, Textile and Garment Workers Federation of Thailand (TWFT) and Automobile Labour Congress of Thailand (ALCT). CILT vows to fight precarious work and push for labour law reform for better protection of the right to organize and collective bargaining. The new Confederation has also on its agenda to intensify trade union education for rank and file members and precariously employed workers. Importantly, CILT has committed to promote women participation at all levels of union structure. Yongyuth Mentapao, General Secretary of TEAM spoke about the plan to mobilize on 7 October to push the Thai government to ratify the core labour rights Convention 87 and 98 to pave the way for labour law reform in Thailand. They argued that the very bad working conditions in Columbia were comparable with those in the textile industry in Bangladesh and that the Netherlands ought to take some responsibility for this. An opinion column in Trouw recalled that, three years ago, Dutch energy companies and social organisations formally began a Dialogue on Coal. The articles note that as Columbia exports a quarter of its coal to the Netherlands, the situation must improve and the country should try and influence the way that companies operate in Colombia. However, the dialogue failed due to the attitude of the energy companies, which do not seem to understand that transparency in the entire supply chain is now a requirement for socially acceptable and sustainable employment. The articles describe cases of workers employed by the multinational Drummond, which is a major supplier to the Netherlands. Data provided by Dutch energy companies showed that more than 12 per cent of coal imported in 2011 was from the Drummond mine. However, their most recent report did not provide full information about the exact origin of the coal exported to the Netherlands. The articles describe the killing and persecution of workers and trade unionists, including the case of a trade union leader who had to go into exile to escape being killed. The government, in the form of the Minister for Development Cooperation and Foreign Trade, Lilianen Ploumen, has said it will pay close attention to the situation at the Colombian mines from which Dutch companies export coal to the Netherlands. The articles insist on the need for transparency in the supply chain. This issue is of great importance for IndustriALL. Union seminars on the mining industry have discussed the importance of strengthening unions and building a regional and world union network. Glen Mpufane, Director of Mining at IndustriALL, has said that the challenges are the same in all regions and that it is important to unite the workers within supply chains. Union membership has declined as the power of the companies has increased. For IndustriALL, a strong and centralised trade union structure can stand up to the companies and, in this specific case, can fight the abuses and ill-treatment of workers and end the supply of coal stained with blood. On 1 and 2 October 2013 upon invitation of the Belgian trade union ACV-CSC BIE, representatives of Holcim works councils and trade unionists from North America, Latin America, Asia, North Africa and Middle East, Europa and Asia, met in Ostend, Belgium to discuss the situation of the workers in Swiss based multinational, Holcim. Although the situation is very different from country to country, the ongoing restructurings in this group causes severe problems. Several delegates stated that according to their experiences Holcim follows more and more a mere finance driven policy rather than an industrial logic. Shareholder value comes first, workers and their living and working conditions are less important for the company. That may make shareholders and banks happy, workers have no reason to be content with the so-called “leadership journey”, which was announced by CEO Bernard Fontana and promises to generate 1.5 billion CHF profit growth until end of 2014. Workers on the other hand face harsh measures, mass redundancies, repeated restructurings, a lack of fair information and consultation and a growing pressure on living and working conditions. “This is not the Holcim I started working for many years ago”, one of the delegates stated. Repeatedly the company violates international standards and also their own values, as published in their Global Reporting Initiative (GRI) statement and on company’s website. Workers have the feeling that – contrary to company’s declarations – the health of the employees does not really matter. In addition the company tends to recur to outsourcing and subcontracting measures in a number of countries. Although the company again and again states that they want a fair treatment not only for their own but also subcontracted workers, this is not the case. This has to change. The Holcim trade union network will send a clear message to the management, demanding that workers’ rights have to be respected and that the company has to take responsibility for those who generate the profits that make shareholders and bankers happy – the workers. At the end of the meeting the continuation of this network was agreed upon. Appointments were made for next two years.